Back to Elizabeth II Definitives. Forward to 1967 Decimal Pictorials. 1960 - 1967 Designs in Detail. This second part will show each of the stamps again but now arranged by their value rather than as in Part One by their issue date. Our purpose here is to consider the design and subject of each stamp. 1960 - 1966 Pictorials Part One. 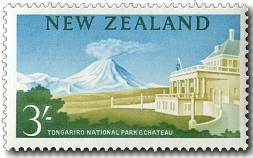 A summary and overview of this issue with the stamps arranged issued order. 1960 - 1966 Pictorials Part Two. This second part shows each of the stamps again but now arranged by their value. 1960 - 1966 Pictorials Part Three. Flaws and errors of the 1960 definitive - low values. 1960 - 1966 Pictorials Part Four. Flaws and errors of the 1960 definitive - high values. 1960 -1966 Pictorials Part Five. Manuka 'Leptospermum scoparium' also commonly called the tea tree, is a bushy shrub found in most parts of the country. The flowers are mostly white, less commonly red, appear in profusion and often almost hide the small reddish-green leaves. The woody fruit have five narrow slits through which the seeds escape. The tree got its European name from a bitter tea that could be made by boiling the leaves. The karaka 'Corynocarpus laevigatus' is a tall tree of the coastal forest and also occurs in picturesque isolated groves casting a welcome shade on rocky foreshores. The dark green glossy leaves reach a length of over 15cm. Inconspicuous greenish flowers give rise to full clusters of richly coloured berries that ripen in strong summer sun. The name kowhai-ngutu-kaka shows that the Maori recognised the close relationship between this plant and the yellow kowhai, at the same time likening its flowers to the beak of a native parrot, the kaka. A soft woody shrub rarely exceeding 1.8 metres, the kaka beak 'Clianthus puniceus', as it is commonly known, has curved and pointed red flowers about 10 cm long. The species is endangered in the wild, with only 153 trees found in a 2005 survey. Although widely grown as a garden plant, the cultivated lines are descended from only a few plants and are not genetically diverse. 'Alectryon excelsus' is a handsome tree, sometimes called the New Zealand Ash. It can reach a height of 18 metres. The tree flowers in spring and the seeds take up to a year to mature. In common with most New Zealand natives, the Māori vernacular name is now preferred for English use. Generally regarded as New Zealand's national flower, the yellow kowhai 'Sophora microphylla' is easily grown and is widespread both in its native state and as an ornamental tree in gardens. We have a kowhai tree planted by my father years ago which has now grown into a large shady tree. I love the display of yellow flowers each year and the tuis, bellbirds and Kererū (New Zealand Wood Pigeon) attracted. 'Hibiscus trionum', the botanical name of the plant known to the Maori as puarangi, is the smaller of the two New Zealand hibiscus. It belongs to the northern frost-free part of the country and can now be seen only in remote places and on some off-shore islands. Commonly known as the Mountain Daisy, there are many varieties found in the mountain distrcts of both North and South Islands. The leaves are covered with a velvety coating of fine hairs and the flower rays are white and daisy-like, being up to 100mm in diameter. Often these plants spend their winter deep under the snow only growing to bloom during the short period of the hottest summer months. In most lowland forest areas of New Zealand spring is heralded by the flowering of the climber now called 'Clematis paniculata' but formerly known as 'Clematis indivisa'. The white blooms, more than 50mm across are borne in masses when the vines reach the full light of the tree tops or the forest edge. At our old house we had one in the trees down along the creek but more recently it seems to have disappeared. Mum used to love seeing that burst of white flowers each year. Koromiko or 'Hebe salicifolia' is a native shrub of which there are seven main species. This is native shrub which was used by Māori for medicinal purposes. It is large, evergreen shrub, reaching 2 m in height, with light green, spear-shaped leaves that are up to 12 cm long. Flowers are white or pale lilac. through to reds and crimson. Hebes have become a popular garden plant for shelter and landscaping. Rata 'Metrosideros robusta' (northern variety) or 'Metrosideros umbellata' (southern variety) , like Manuka, belongs to the myrtle family. The vines affix themselves to tree trunks and rocks by short roots from the stems. The flowers are conspicuous because of the bunched stamens, which in this species are 25mm long, reddish-orange and tipped with yellow pollen when freshly opened. Flowering amongst the tree tops or in roundish clumps in partly-cleared country, the rata provides a splash of colour in winter. By design and format rather than value, I have included the 9d in the middle group of this issue. This group usually comprises five values, one of which was reissued as a multicolour 3 years later. They are all similar sized, being larger than the low values but not as large as the oblong high values. New Zealand Flag - 9d. 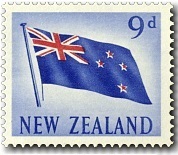 New Zealand's national flag, a Blue Ensign bearing the four-star Southern Cross constellation was not adopted for general use until the gazetting of the Royal assent to the New Zealand Ensign Act on 12 June 1902. The 'Union Jack' in the top left corner represents New Zealand's links to Great Britain and the stars of the Southern Cross are seen throughout New Zealand all year round. Since this flag is so similar to the Australian one, in 2015 New Zealand is going through the process of deciding if we should adopted a new flag. Timber Industry - 1/- (1 shilling). Although New Zealand was a heavily forested land when the first European settlers arrived, clearance of the land for pastures, deliberate and accidental burning, and the operations of timber mills threatened the extinction of the timber resources. Fortunately, reforestation projects have given an assured future to the timber industry. Both exotic and native timbers are being milled in large quantities for use within the country and for export. 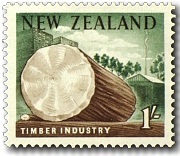 The design of the stamp was commissioned by the New Zealand Timber Merchant Federation. 1/3 - Fishing - Trout - 1/3 (1 shilling 3 pence). 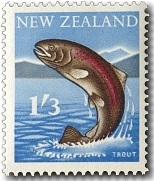 The rainbow trout (Salmo gairdnerii) originally introduced from the Pacific Coast of America has thrived so well in rivers and lakes of the central North Island and high-country lakes of the South Island that angling for fish has become an important tourist attraction. My husband was a keen fisherman before his accident. I miss the strong taste of a trout, only getting one if we visit friends near Cambridge. 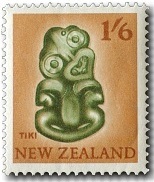 Tiki - 1/6 (1 shilling 6 pence). The greenstone hei-tiki was one of the commonest forms of neck pendant worn by Maori of high rank when Europeans first came to New Zealand. Greenstone is an extremely hard material. Back in 1960 it was commonly called a 'tiki' but now the more correct name of 'hei-tiki' is used. Allan wrote more about this in a post he did. Aerial Top Dressing (Brown) - 1/9 (1 shilling 9 pence). Farming from the air is now an established part of New Zealand's agricultural economy. Operating from 12,000 farm airstrips, aircraft undertake a variety of work which includes topdressing; aerial surveys of noxious weeds; spraying of weeds and crops; airdrops of fencing posts and hay bales for stock; fire fighting; laying of chemical fire breaks and poison baits. More recently has seen the environmental concern of fertiliser drifting over areas and waterways where it becomes a problem. Aerial Top Dressing (multicoloured) - 1/9 (1 shilling 9 pence). 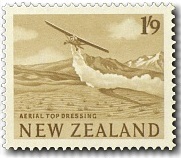 The (Brown) Aerial Top Dressing was reissued as a multi-coloured stamp. 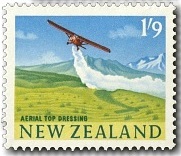 Now with the blue sky, green hills and paddocks and a red aircraft we have a much more attractive stamp. We have an airstrip up on top at the back of our farm. They use it for our farms and the surrounding ones in the valley. We earn money from leasing out the airstrip each year. Now we come to the higher values, six designs with also one being re-issued as a multicolour. This group ranges in value from the brown & black 2/- (2 shilling) up to the pink £1 (1 pound). 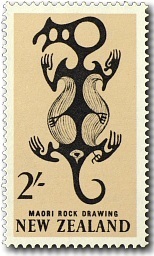 Although Maori art of the period of first European contact had previously been featured in stamp design, this South Island rock drawing of a taniwha was the first archaeological subject chosen from Maori pre-history to be depicted on a New Zealand stamp. The drawings are in a limestone cave shelter which overlooks the south bank of the Opihi River in South Canterbury. The taniwha is a mythical monster of Maori tradition, which was described as a gigantic man-eating reptile lurking in deep pools. Find more on Taniwha in our index - The Maori People. 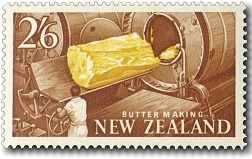 At the time of issue of this stamp New Zealand manufactured around 220,000 tons of butter a year of which more than three-quarters of this quantity was exported, hence the importance then as now of dairy products to the country's economy. In 2014 dairy products accounted for 25% of New Zealand's exports. Our old farm here is now run by Anne and her team of girls. (Yes woman's power!) They have more than 3 times as many cows and each day a full milk tanker and trailer leaves for the Dairy factory, with milk to be processed into butter and cheese. 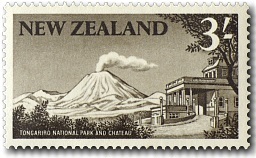 This the first of New Zealand's National Parks originated with a gift of the mountain tops of Tongariro (1968 metres), Ngauruhoe (2290 metres) and Ruapehu (2796 metres) by Te Heu heu Tukino and associated Maori Chiefs in 1887. The building on the right is the Chateau Tongariro, a lovely old hotel. Once we took a train trip there and stayed the night, then returning to Auckland the following day. 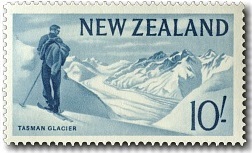 The 1/9 Toppdressing remained the same when it appeared in multi-colour but this stamp here has been redrawn. Notice the smoke from the volcano, the shrubs in the foreground have lost their detail and the tree on the right has gone completely. The Chateau has also been turned to show more of its front. The value has been moved too. For more on this park see our post 2015 - UNESCO World Heritage Sites. The Tasman Glacier is the largest of several glaciers which flow south and east towards the Mackenzie Basin from the Southern Alps in New Zealand's South Island. It is New Zealand's longest glacier. Tasman Glacier, which is not only the largest glacier in New Zealand but also one of the largest in the temperate zone, is in the South Island's Mount Cook National Park. The glacier has retreated about 180 metres (590 ft) a year on average since the 1990s and the glacier is now in a period of faster retreat where the rate of retreat is calculated to be between 477 to 822 metres (1,565 to 2,697 ft) each year. It is estimated that the Tasman Glacier will eventually disappear and the terminal Tasman Lake will reach a maximum size in 10 to 19 years time. The Sutherland Falls, located in Fiordland National Park, drop from Lake Quill over a steep-walled mountain parapet of the upper Arthur Valley in three successive leaps - the topmost 248 metres, the middle 229 metres, and the lowest 103 metres. 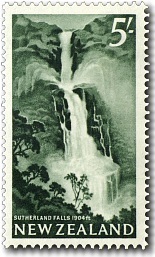 The falls were long believed to be the tallest waterfall in New Zealand. However, Browne Falls cascades 843 metres (2,766 feet) down a mountainside in Doubtful Sound, leading some to view that as the tallest. For more of Fiordland National Park 2015 - UNESCO World Heritage Sites. The giant Pohutu Geyser at Whakarewarewa, near Rotorua, flings boiling water over 20 metres into the air. It is one of the great attractions of the central North Island's thermal region. Most of the currently active geysers at Whakarewarewa are located on Geyser Flat and aligned on a common fissure. This is a highly complex system, with the activity of one geyser affecting another. Prince of Wales Feathers Geyser, Pohutu Geyser's closest neighbour, always precedes Pohutu, a feeble jet at first but gradually increasing in power until a continuous 9 m high column is ejected at an angle, when Pohutu usually erupts also. Sometimes Waikorohihi Geyser erupts a discontinuous 5 m high jet, then Prince of Wales Feathers will commence, later followed by Pohutu. 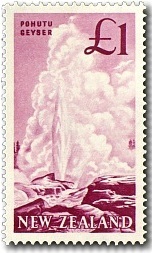 1979 - 1980 Scenic Stamps. 1962 - 1963 Communication Centenaries. 2015 - UNESCO World Heritage Sites.